Monday is Memorial Day which means the official start of the summer season. I have one word. When I think back to some of my favorite times, I think of picnics. They just speak of simple summer fun to me. Some of the best picnics I remember were right in our own backyard on an old picnic table. 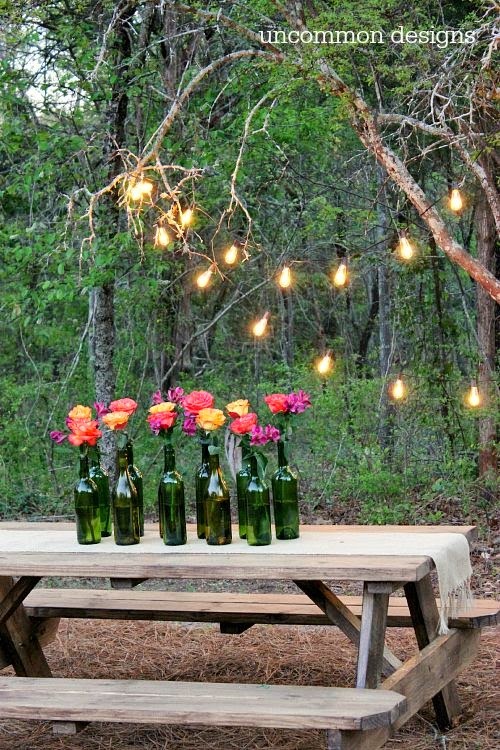 As I am bottle obsessed, I love the idea of using old bottles with pretty summer flowers as the centerpiece. When I was first married and living in a big old farmhouse in the country, I used a picnic table for my kitchen table. It worked great and I loved the memories it evoked. Don't have a picnic table? 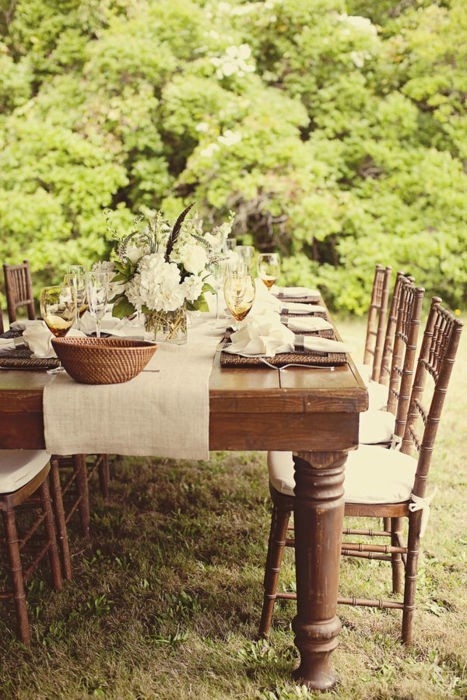 Pull a table that you already have on the porch or in your house out onto the lawn for a summer picnic. Of course I would probably be too lazy to bring out a table, but a picnic on an old blanket out on the lawn works just as well for me. My daughter and her family are on their way to to the Outer Banks in North Carolina today. I hope they get to have at least one picnic on the beach. Although with three kids, their picnic might not be this fancy. 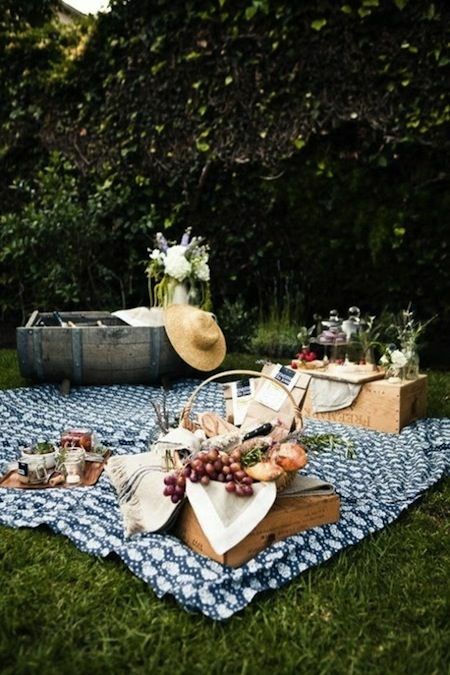 Yes, the summer season is here and I can't think of anything simpler or more serene than a picnic. 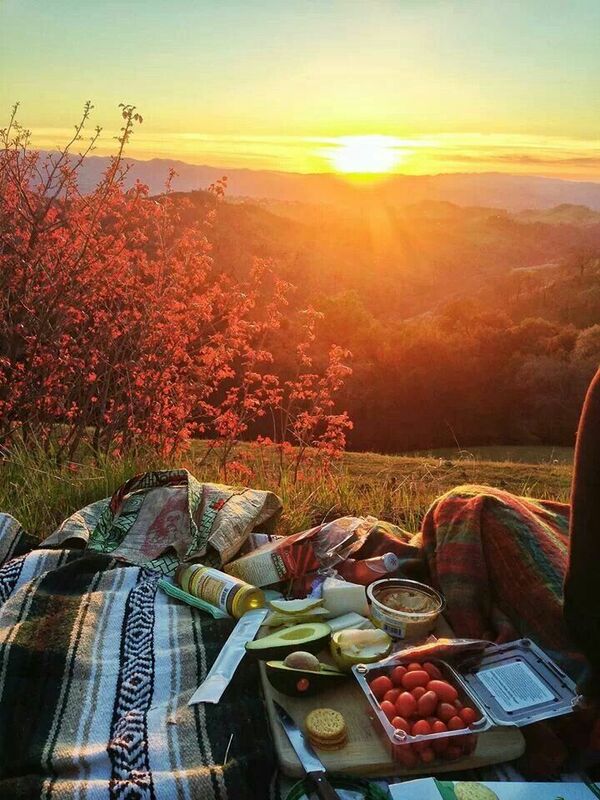 So here's wishing you lots of fun outdoor meals from sunrise to sunset. I love all the photos and sights. I think an afternoon picture under tree in the first photos would be fun. 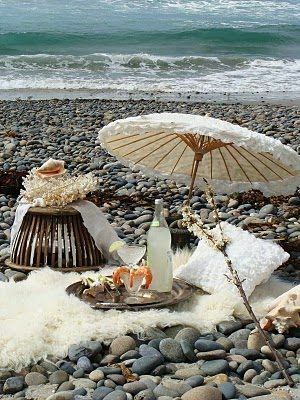 I love the tablecloth spread on the ground and the picnic stuff on the crates, but my favorite place in all the world is the beach. I have never been to the Outer Banks but it's one of my want-to places. I hope you have a fun-filled week. Soak up the sun and the peace that it brings. Ahhhh.... love all these settings. have a wonderful weekend. Hope you have a wonderful weekend too, Laura. I love picnics and dining on our deck in the summer. We haven't picnicked in a while but we often eat on our deck when the weather is nice in July and August. I'm sure looking forward to it! eating on the deck is like a picnic to me. We are having perfect weather for it here now. Hello Laura....Loved your post. Great photos, too. Your bottle bouquets were very pretty, too. I love the idea of a picnic table inside! It was perfect for my big farmhouse kitchen, Brenda. I'm so jealous too, Lynn. especially since they are going to Ocracoke Island. My favorite. Three weeks with your granddaughters? How wonderful. Hey Laura, your'e on Blogher now!! Congrats, and welcome, it's such a wonderful community.